Sorry, all. I realize it has been very long since I posted anything. I was diagnosed with terminal brain cancer in November. I will likely not be posting here any more in the future. Keep sending out love and silencing hate... and keep reading. The world needs more readers even more than it needs strong writers. Reading is important. I cannot believe this is the first time I have ever read an Arthurian Legend. Before a few weeks ago, I didn't know this work was part of said canon... me being notorious for not reading reviews. In August I made a trip to the British Library and paid for a 'special exhibit', where I saw a copy of the Folio Society version of this work and based on the cover and a brief description, I was in love. When I finally joined The Folio Society in December, I knew this would be the first work that I purchased. 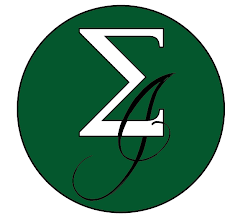 The translation of the Folio Society publication is by Simon Armitage and since I have no object of comparison, there is not very much I can say about it. It had a simple flow and was definitely an easy read. The illustrations by Diana Sudyka were not my cup of tea at all, with the exception of the beautiful cover... of of the most beautiful I have ever owned. The Folio Society publication was fairly large, measuring 13" by 9 1/4" - I believe it was a little too large to read with on the couch and my roomie thought it was a little humorous. There was a lot of blank space on most pages, but for those that love the feel of great paper, this was up to the usual thick standard with a creamy ivory colour. 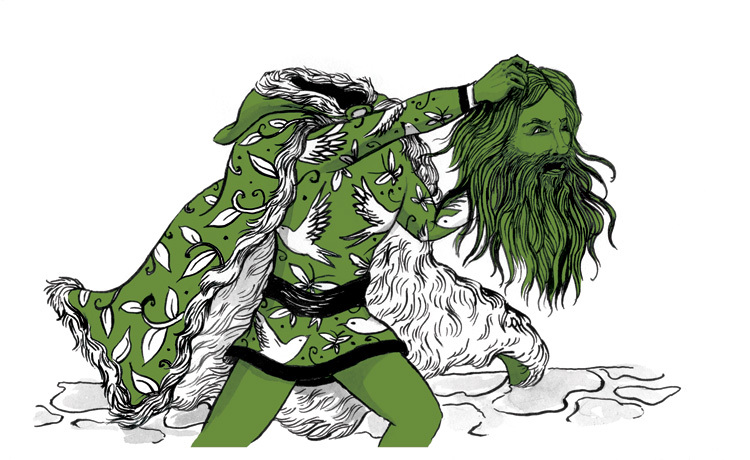 The work itself is about a Green Knight that comes at Christmas to challenge the Knights of King Arthur to a holiday 'game'. He is completely green, from his clothing to his skin... and even his horse is green. He challenges anyone to cut of his head with an axe and if he lives, in one year, he gets a chance to cut off the antagonist's head - a sort of 'head for a head' thing. Why anyone thinks this is a cool party game is beyond me, but King Arthur accepts the challenge when no one else will. Sir Gawain stands up to the Knight simply to take Arthur's place. I won't go into what happens from there, but the tale is all about honour, truth, sins of men and the temptation of men by women (see quote below). The tale in itself is told quite simply, but has a wonderful message. 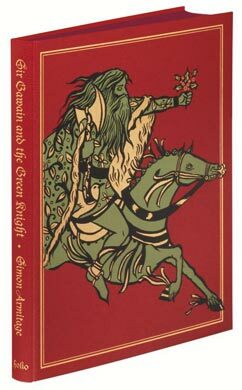 While Sir Gawain lives by an honour code, even he can fall off track when encountering certain situations in life and he must constantly remind himself of this to stay on what he believes is a righteous and honourable path. I would like to eventually read the translation by J.R.R. Tolkien. Tolkien was influenced by many of these ancient works including this one and Beowulf which were instrumental in the crafting of his fantastical world. 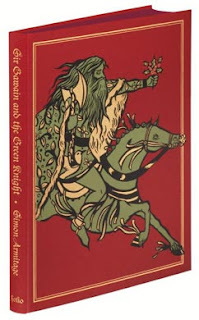 I'm glad I read the work in general - it has a good message and I didn't see the plot twist coming, and while it gave me a good preliminary feel for Arthurian legends, it didn't have the impact of some of the other ancient works I have read as of late... such as Gilgamesh & The Song of Roland. "'And mind you commend me to your mannerly wife, both to her and the other, those honourable ladies who kidded me so cleverly with their cunning tricks. But no wonder if a fool should fall for a female and be wiped of his wits by womanly guile - it's the way of the world. Adam fell for a woman and Solomon for several, and as for Samson, Delilah was his downfall, and afterwards David was bamboozled by Bathsheba and bore the grief. All wrecked and ruined by their wrongs; if only we could love our ladies without believing their lies. And those were fellows from fortunate families, excellent beyond all others existing under heaven,' he cried. 'Yet all were charmed and changed by wily womankind. I suffered just the same, so clear me of my crime.'" 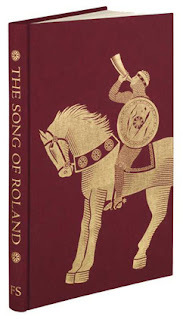 I had never heard of The Song of Roland before my membership with The Folio Society, but I'm glad they introduced me to this work. This particular edition is translated by Charles Scott Moncrieff and illustrated by Anna and Elena Balbusso. It's hard for me to comment on the translation, but I found this work incredibly poetic and very easy to read. The illustrations were hit and miss for me - a very modern take that I don't really think fit the work. Some of the illustrations, such as the one further down in this review, were quite stunning. The cover presented is BEAUTIFUL... and I think, very representative of the story and, in this case, the most poignant scene of the poem. This story is really about a battle between Pagans and Christians, the Christians (Romans) attempting to take over large amounts of territory to pass along Christianity to others with 'inferior' religions. King Charlemagne is about to wage war with King Marsile (Muslim), but offers treasure and conversion to Christianity if Marsile and the Franks will go back to France. Roland's stepfather, Ganelon, becomes a traitor in order to get back at Roland for volunteering him to be the messenger of the offer. They betrayal of Roland and the Christian Knights leads to their slaughter. Roland's pride becomes his downfall when he refuses to blow his horn (olifant) when he sees that he is outnumbered. He acts on courage and the belief in God - he himself believing that he is fated to die. After everyone dies, he finally blows his horn... bursting his temples and causing his own martyrdom. He is met by a saint who takes him to Paradise. King Charlemange comes to the call to bury the dead and mourn the loss of his nephew. He is eventually met with a Spanish Muslim contingent which is destroyed. Ganelon is quartered for his betrayal and those who stood up for him in his trial are subsequently hanged. The ending of the work, I believe, is the best part. King Charlemagne has another dream (the first from God, warned him about the treachery of Ganelon - which he believes is fated and cannot be stopped) that tells him that he must continue to push on to battle with another foe - I suppose to continue to spread the message from God (Christianity). He is tired, but realizes that man does not choose his own path and he must follow what is presented to him. This reminds me of my favourite Steinbeck quote, "You don't take a trip, a trip takes you." I think that if you let yourself be open to things the universe will guide you. I believe we each have the power of choice, but I believe we are given cues to follow and can choose to do so or not. King Charlemagne is clearly put all his faith in these cues, which he believes come from God. Giving up your control to a 'greater power' creates quite a struggle and this struggle is evident with Charlemagne and is captured quite beautifully. This work was a little too 'rah rah Christianity' for my liking, but is quite fascinating when looking back on the believed cleansing by Christians over 1,200 years ago. The blood-thirsty revenge seems very un-Christian on the surface, but this gruesome slaughter was seen as justice and not as cleansing... and I suppose the same could be said of Hitler's belief in the genocide, though not based on religious principles. The pride of Roland was quite frustrating and proved to be his Achilleus' heel. This was one example in the poem that showed the characters in the Song of Roland to be quite human... both with strengths and flaws. I'm quite glad that I read this work - it has left quite an impression on me. I think I will eventually do some more research into the beginning sweep of the forces of Christianity. I know there is a new set from The Folio Society called 'Pagans and Christians' by Robert Fox Lane... and I believe I will keep my eye out for this one. If anyone has read that work or The Song of Roland, would love to know your thoughts! So we're three weeks into 2013 and I'm just getting to a 'year in review' post for 2012. I didn't get back into the country until two weeks before Christmas and I have been spending time catching up with people and getting my bearings. From a personal perspective, 2012 was a great year for me and I guess it's very difficult to complain when you only work for 1/3 of it, travel for 1/2 of it and use the remaining time to organize, reflect and read. Last year I was only able to get to 18 books or so and this years' goal was to get through two a month (24 for the year). I did it - and still had time to read a book of short-stories and a Shakespeare play. This year I spent a lot of time reading the ancient classics, and I was extremely lucky to have a bookclub which thought this was a good idea. After reading Homer and Aeschylus last year, I was able to read some Euripides and Sophocles in order to round out some of the great tragedians. 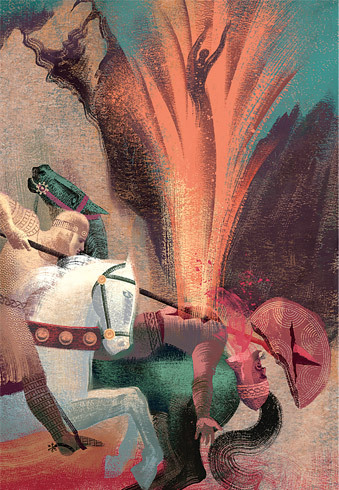 I was also able to read Virgil's Aeneid to get a Roman epic experience. This led to a better understanding of Dante's Divine Comedy... as Dante travels around Hell, Purgatory and Heaven with Virgil as his guide. I was also able to read a bunch of other epic, non-Greek works such as Beowulf, The Rubaiyat of Omar Khayyam and the Tale of Genji. There is only one really long work read this year - that of Genji... a 1,200 page epic from 1,000 AD. There are a few books that I have wanted to read for a long time that just don't fit into any categories or grand unified reading plan, such as Walden. There are a bunch more self-help type books this year, as I have been going through some transformational change given some of the life-events mentioned at the top of this post. 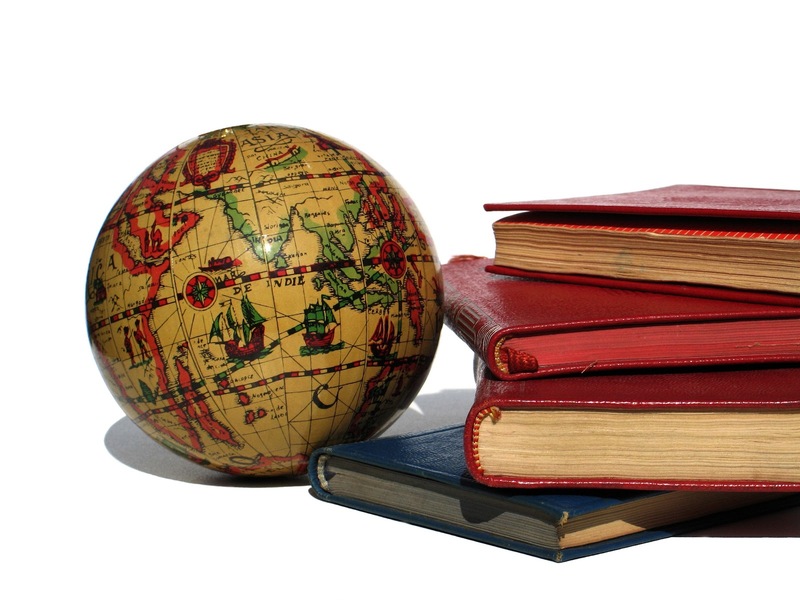 Many of the other books were ones that I read simply because I had access to them traveling... a freeing way to read when one is used to providing oneself with a very structured approach to reading. With Beowulf, I think I read the wrong translation (William Leonard). Everyone that read the Seamus Heaney translation seemed to like the work a lot more and given that I tend to generally like these myths/ancient epics (such as Gigamesh), I was quite surprised that this one didn't resonate with me especially since it inspired so much of Tolkien's work. The Rubaiyat is so sacred, that I was surprised that I didn't find more transcendence in it... when I think back, what sticks out the most to me was all the wine drinking. Plato's Republic was tremendously satisfying, but it was rather academic in many cases. Coupled with some of the language and outdated theories (due to more information now as well as different lifestyles), there were times in this work that I really struggled. I found that it was all worth it, but it did test my patience at times. This has nothing to do with the quality of the writing or the literary acumen, but simply that this book changed my life when I was in need of self-discovery. New Authors Discovered/Explored in 2012: Dante, Boulle, Chekhov, Euripides, Hawthorne, Honore, Kerouac, Khayyam, Larsson, Melville, Redfield, Rubin, Shikibu, Sophocles, Thoreau, Virgil, Wallace, Woolf... a good majority of my reads this year were from new authors (to me). Genres/Books/Authors I wish To Read More Of in 2013: I really want to read more Greek works, other ancient epics, some myths, some poetry and at this very moment... I feel like more Hemingway and Steinbeck. 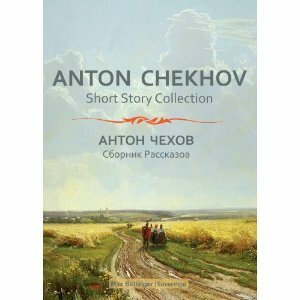 I also want to try some Russians like Gogol and Pushkin (both of whom I've never read). Thanks for reading this post and bearing with me through my hiatus from book reviewing. Looking forward to hearing about your experiences from last year, any recommendations you have for me, and/or your thoughts in general. ﻿﻿There I was sitting in my hostel in Nottingham after just finishing Ben-Hur, and I came across a copy of Henry V by Shakespeare (eventually passed down to a friend in Luxembourg). Somehow or other, a few weeks later when I arrived in London... I went to go see a show at Shakespeare's Globe - and as it turned out, they were playing Henry V. I only read the work AFTER the play, which is generally in the opposite order I usually do these things. I was incredibly surprised on how more enjoyable the overall experience was following this methodology. Since Shakespeare is supposed to be watched MORE SO than it is read. I think this inherently makes sense. Many aspects that I missed in the theatre, I was able to dedicate more time to while reading the work. In addition, because I had SEEN all the characters they became alive on the page much quicker - and I was able to compare the characters in the novel to how the actors portrayed the characters in the play to see if I felt they were able to get the characters right or if they did Shakespeare himself a disservice. Henry V at Shakespeare's Globe was quite breathtaking, despite the tremendous uncomfortable feeling present in my seating arrangement. I have long legs and I sat in the front row with a wooden railing in front of me - I was never comfortable and it took away much of my concentration on the dialogue. This play was quite enjoyable and stimulated much further research into the King and the story itself. 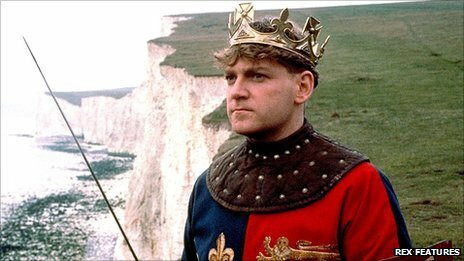 I do also remember thinking that the movie adaptation with Kenneth Branagh was one of the better Shakespeare film adaptions I've seen (along with Hamlet with Kenneth Branagh, if I recall correctly - unsure if I enjoyed this one more or less than the Mel Gibson version). In summary, the play is about the events pre and post The Battle of Agincourt, a battle between the English and the French in 1415. 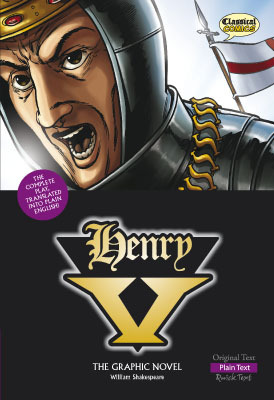 The battle is won by the British, and according to the play, there is such an extreme difference in body count that Henry V believes that God has intervened on his behalf. The best part about the play is Henry's personal struggle between doing what is good for the people and what is good for himself, along with overcoming the legacy of his father. These are classic themes and Shakespeare really allows you to FEEL them as you read the play. Like most Shakespeare, there is an ample supply of wit - both intelligent and bawdy. In addition, like Shakepeare Histories, there is a 'happy' ending... when Henry marries the French princess. I believe the ending is drawn out too much - with all the signing of documents, courting, etc... but this will be a matter of preference. It reminded me of the feeling I had when reading the last instalment of the Lord of the Rings, The Return of the King, which seemed like the ending took so long to wrap up that it didn't feel like an ending anymore. So, as you can tell this is not a strong 'review' and should probably not even be classified as such. This lack of detail is a direct result of me not writing down any of my views as soon as I finished watching the play or reading the work. Would be interested to know what YOU think of it - perhaps it will bring some of my personal thoughts back. Shakespeare, I believe, is best when discussed and dissected. I am going to keep this review extremely short. You will either love this book or you will hate it. If you believe in a higher form of spirituality, but aren't quite convinced about structure existing in religion, it may be a good book for you to read. If you do not believe in anything and think all 'spiritual stuff' is hokey, then don't bother reading this work. If you're a devout Christian/Muslim/Hindu/etc and cannot fathom anything that your religion does not teach explicitly, then don't read this book. You should only read this book if you believe there is something else going on that you can't quite grasp, but are open to... or you believe you're currently in the midst of a spiritual awakening. This book has some hokey elements in it - and I must admit to not believing in certain concepts by the author (especially those relating to 'what happened to the Mayans' - which I believe tarnished an otherwise great book), but I will say that The Celestine Prophecy changed my life. If you fit the criteria mentioned above, then I encourage you to see if there is anything in this work that can change yours too. I should also mention that the writing in this work is not very good at all. It is all about the message and it's important to keep that in mind if you decide you wish to read it. For those of you who give it a shot, good luck... and enjoy. 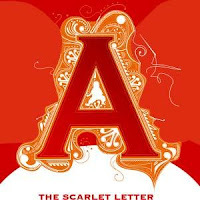 The Scarlet Letter is the story of Hester Prynne, a woman that commits adultery and is brandished with a red letter A - as a warning to others of the sin she committed. She is publicly ridiculed and despite this, refuses to give up the identity of the male culprit. Pearl, Hester Prynne's daughter, is also a constant reminder to Hester of her sin... and the child is credited with many spiritual qualities, both angelic and demonic. Hawthorne reminds me of a poor man's Thomas Hardy. He has thought out the plot, spirituality, an ostracizing from society, redemption, etc of this book very well - the story itself is a marvel. However, the prose is far from Hardy standards and of course, the work does not have the typical Hardy tragic ending. However, the carefully woven plot is indicative of Hardy with the exception that it doesn't seem to be as complex a web. The work is brilliant in it's own right, but feels amateur when compared to some of the other greats of Hawethorne's time. 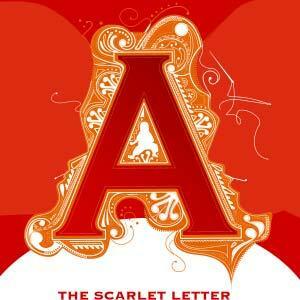 I enjoyed reading the story of Hester - she was a lovable character that you couldn't help but root for. The innocence, depth and devilishness of Pearl was written beautifully and it made you love her and feel creeped out by her at the same time. Her presence lingers on you well after you read about her and I haven't felt this way about a character since nearly a year ago, when I read Jack London's The Sea-Wolf. While the conclusion was not quite expected, I found myself predicting much of the plot elements - indicative of a slight formulaic approach to writing. The story itself is one that will stick with you, and I believe that when coupled with the carefully woven plot, the work is justly considered a classic. I wouldn't classify it as one of the top 50 of all-time, but I'm glad that I read it... I enjoyed the story and it taught me both positive and negative aspects of writing.